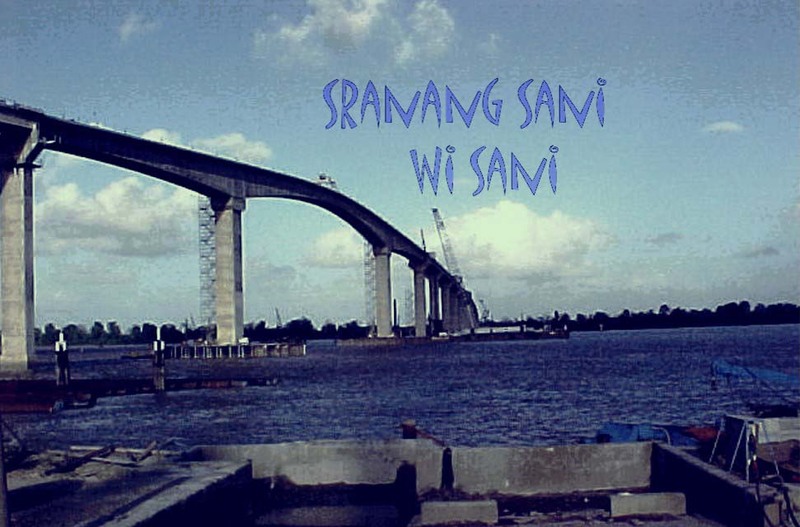 In the summer of 2000 one of the most important projects in the history of Suriname was completed: The bridge across the Suriname River. It's official name is "The Jules Wijdenbosch bridge". The bridge is named after the president who opened the bridge. The Suriname Rivers rises in the center of Suriname and ends in the Atlantic Ocean. Paramaribo, the capital of Suriname is near the Suriname coast. When the Suriname river reaches Paramaribo it has become a wide river. The narrowest place to cross the river is over 600 metres. Before the summer of 2000 the only way to get across the Suriname river was by ferry. People and cars have to get in line and it takes a long time to get across the river. Some people with little speed boats offer quick trips across the river, but ofcourse this is no solution to the problem. For the economy of Suriname it is important to have a permanent connection between Paramaribo and the eastern side of Suriname. Paramaribo is on the west bank of the Suriname. On the other side of the river is Meerzorg. Meerzorg will develop itself more and more, since it will become easier to get into Paramaribo. A whole province, which is called Commewijne, after the Commewijne river will benefit immediatly from this permanent connection. Other towns, who will benefit also are Albina, the capital of the Marowijne district in the east of the country, called after the Marowijne river, the border between Suriname and French Guiana, and Mungo, the former bauxite town in Suriname. It has to be clear that this bridge is essential for the development of the country. The whole economy will benefit from this bridge, because it will become easier to cross the river and the trade will become better. Here is a picture of the Suriname bridge under construction. The bridge was built in a co-operation with the Dutch company Ballast-Nedam, which is famous all over the world. The Dutch have lots of expertise in building bridges, tunnels, dikes etcetera. A famous saying is: "God created the world, and the Dutch created the Netherlands...". With the completition of this bridge, the final link in the chain of roads, which connect the East of the country to the West, will be completed. It is very important for Suriname that the traffic can move easily from the East to the West vice versa. This East - West connection road is in the northern part of the country, since most of the cities in Suriname are in the northern part of the country. 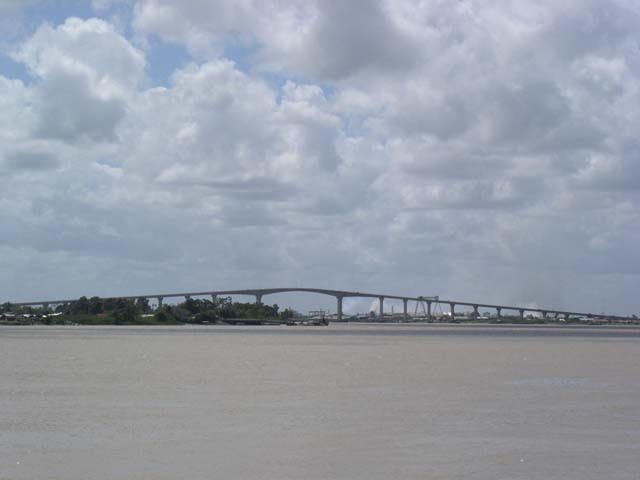 The Suriname Bridge seen from the Waterside (Waterkant) in Paramaribo. Suriname is working on it's future and an expression of this results in this bridge.